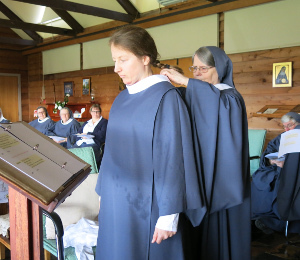 On 3 June, the Eve of Pentecost, Janice Boddice was clothed in our monastic habit. Janice entered our community on 31 May 2016 coming to us from Queensland. 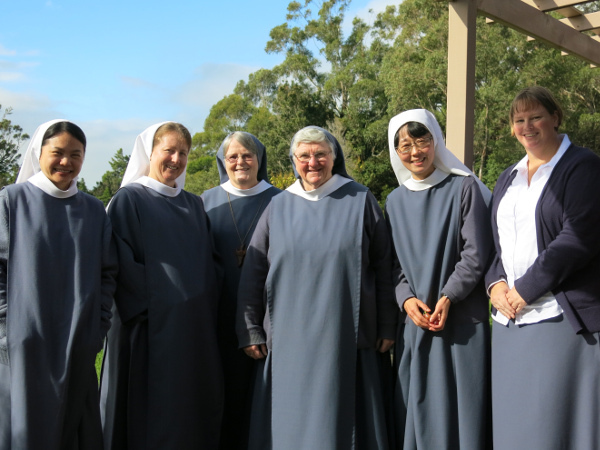 Over the past year, Janice has entered fully into our monastic life so it was a great joy to us all that she asked to be clothed in the habit, thus entering our Novitiate and continuing her journey of seeking God in the monastic life. Janice chose the name “Sr Marie Joseph” sharing that St Joseph has been the saint she has always turned to in times of need. The hiddenness of his life speaks to her heart, as well as the fact that there was nothing special anyone thought to note in detail about him in the scriptures. The fact that Joseph and Mary remained very close to Jesus and would have known him better than anyone else also influenced her choice of name. 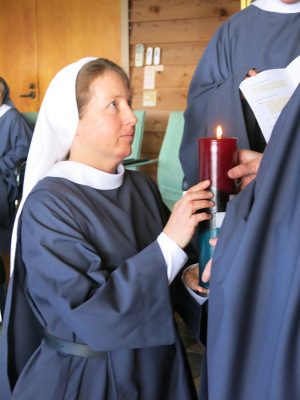 A special candle, designed by the sister being clothed, is always presented to her by the Abbess during the ceremony. Janice chose a Celtic symbol on her’s and explained that the design reflected the fact that over the passage of time, she has come to realise that being Catholic, remaining Catholic and entering our monastic community, is the direct action of the Holy Spirit in her life. Janice witnessed that her Catholic faith was the gift from her Irish ancestry, and so the Celtic design on her candle signified this reality. Sr Marie Joseph spent quality time with her parents, Carmel and Ian, who drove down from North Brisbane to be with their daughter both before and after her ceremony. No doubt, it will take them a little time to get used to seeing her in a habit! 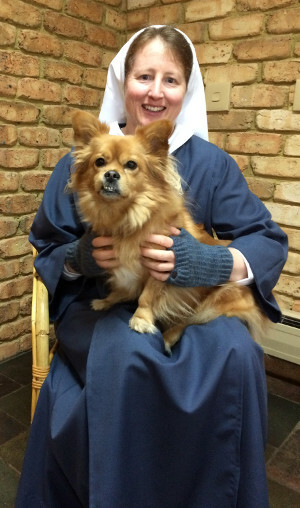 Sr Marie Joseph is a skilled gardener, a lover of the outdoors, and part of our little dog, Polly’s social circle! 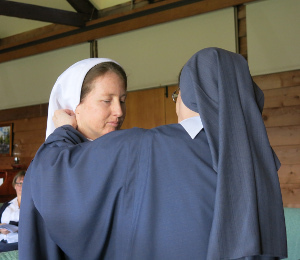 This beautiful photo shows Marie Joseph in her new habit receiving congratulations from Polly! We thank God for the gift to our community, of Sr Marie Joseph (Janice Boddice).